As the Italian furniture giant turns 50, we take a look inside its Novedrate headquarters, where sketches are turned into sofas. It starts with a toy duck. To tell the story of B&B Italia is to explain the history of its production process, which begins at a trade fair in London, where a small plant presented its method for manufacturing the small children’s trinket. It sparked a big idea. When the late Piero Ambrogio Busnelli founded the Italian furniture line with Cesare Cassina in 1966 (it was called C&B Italia until Busnelli took full ownership in 1973), he had the foresight to evade traditional hand-construction, which limited sofas and chairs to 90-degree angles and standard materials, and focus on industrializing production. In England, he saw how the anatre were made: Polyurethane is cold foamed in molds, then it solidifies into the desired shape. Busnelli, a shrewd and dogmatic entrepreneur, decided to adopt such a technique for interiors—an idea that classified him as a pioneer of modern Italian furniture. His thinking proved to be, quite literally, outside of the box—sofas and chairs began to take on sinuous, fluid shapes, standing out from the squarish options then on the market. 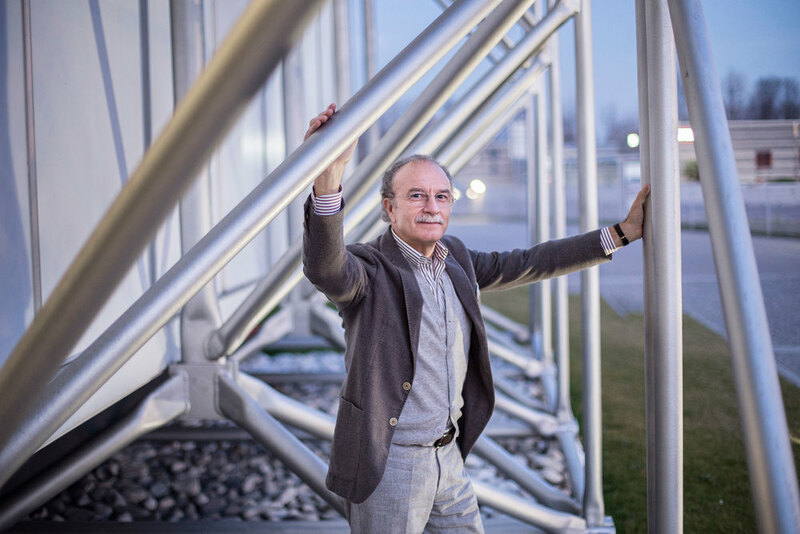 “My father realized that he’d done something incredible, something that didn’t exist,” says Giorgio Busnelli, CEO of B&B Italia and son of Piero. And so, a company that started with just 10 employees in Novedrate, Italy, became a rule-breaking global force. Fifty years since its inception, the brand—still based in the same municipality, in its Renzo Piano and Richard Rogers–designed headquarters—celebrates an impressively vast portfolio of indoor and outdoor furniture that includes collaborations with designers such as Gaetano Pesce, Antonio Citterio, Patricia Urquiola, and Naoto Fukasawa; 45 monobrand stores around the world; and its contract division, whose recent projects span the Mandarin Oriental in Milan to the soon-to-open, John Pawson–designed W Tel Aviv–Jaffa. “The cycle of life for a good product is timeless,” says Busnelli, who still green lights each design that goes into production with a keen decisiveness—a trait passed down from his father. It could be said that such intuition for staying power is the reason for his company’s rich history, evident in B&B Italia’s current catalogue, which includes pieces dating back to its founding year. Now, with decades worth of stories to tell, its rich past has been chronicled threefold: A documentary by Didi Gnocchi and Milan-based 3D Produzioni aired last month on Sky Arte HD in Italy and during events worldwide; writer and designer Stefano Casciani conceived and edited a hardcover tome; and during Milan Design Week, an interactive exhibition by Migliore + Servetto Architects was on display at the Triennale Design Museum. But the most marked point of the company’s narrative is inside the factory, where the founder’s technology, adapted from an unsuspected industry, remains unchanged.